Presumptive No. 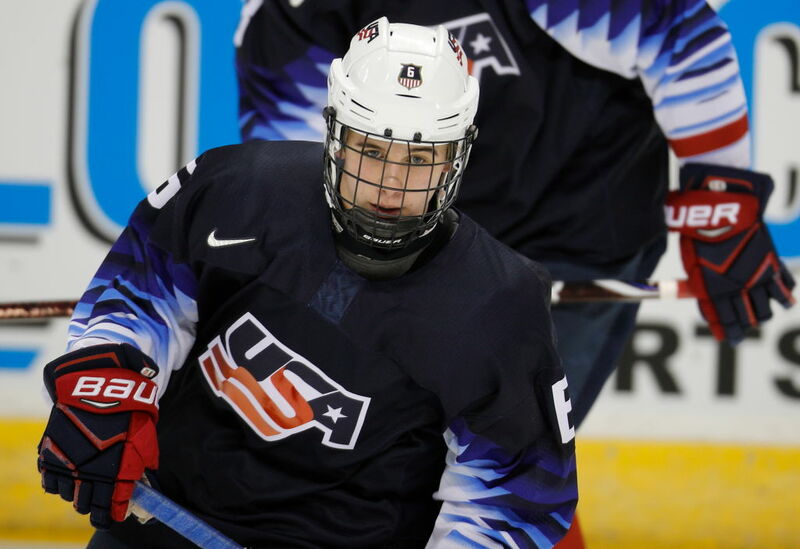 1 draft pick Jack Hughes played for Team USA at the World Junior Championships in Vancouver (Getty Images). The NHL playoff race entered the final week of the season on Monday. Not in Buffalo, of course, where the Sabres are out of the hunt for the seventh straight year and will miss the postseason for the eighth season in a row. The Sabres are at the opposite end of the standings, where their collapse to the finish line could have direct correlation to their success in the NHL Draft Lottery. There are three games left in the regular season, starting with Tuesday's visit by Nashville to KeyBank Center, and the Sabres have slipped all the way to 28th out of 31 teams in the NHL's overall standings. They have 72 points, just two ahead of New Jersey after the Devils' 4-2 win Monday over the New York Rangers. Los Angeles (67 points) also could pass the Sabres while only last-place Ottawa (62) can't catch Buffalo. The Sabres are 1-12-2 in their last 15 games and have not won in regulation in 18 games, since their Feb. 23 upset of defending Stanley Cup champion Washington. The lottery will be held April 9 in Toronto and the results will be revealed live on NBCSN. As in previous years, all 15 non-playoff clubs will qualify and there will be three drawings: The winner of the first draw will get the No. 1 pick in the NHL Draft on June 21 in Vancouver. The second draw determines No. 2 and the third draw determines No. 3. The odds are unchanged from last year, when the Sabres finished in 31st place and won the lottery to earn the right to draft Rasmus Dahlin. The team with the fewest points will have the best odds of winning the No. 1 pick at 18.5 percent. The odds then move to 13.5 percent for the 30th-place team, 11.5 percent for 29th, 9.5 percent for 28th and 8.5 percent for 27th, which appears to be the lowest odds the Sabres will have. An added wrinkle to the 2019 lottery is that Ottawa appears likely to finish 31st – but the Senators traded their No. 1 pick for this year to Colorado for Matt Duchene. It leaves the Avalanche in the enviable position of potentially making the playoffs and having the best odds to also get the No. 1 pick. The lottery winner is expected to take 5-foot-10 center Jack Hughes, an Orlando native playing with the U.S. National Development Team. Hughes has 23 goals and 86 points in 41 games this season for the Under-18 club. The No. 2 pick is likely to be 6-2 Finnish right winger Kaapo Kakko, who outplayed Hughes and scored the gold medal-winning goal for Finland in the World Junior Championships. He's playing for Liiga in the Finnish pro league. Lottery week figures to be a huge one for Colorado, which has a great chance to get a Top-3 pick and could add the likely Hobey Baker Award winner to its lineup for the playoffs at some point. The favorite to win college hockey's Heisman is UMass defenseman Cale Makar, who was taken No. 4 overall in 2017. Makar will be leading his team in the Frozen Four at KeyBank Center, ironically in an April 11 semifinal against the University of Denver, and is expected to earn the Hobey in an April 12 ceremony in Harborcenter. If his team loses its semifinal game, he could sign with Colorado that day as well. Monday was the Sabres' final scheduled off day of the season and the game against the Predators is their second-to-last at home. It's a huge one for the visitors, who are in the midst of a three-way battle with Winnipeg and surging St. Louis for the Central Division title. The Predators have 94 points, two behind first-place Winnipeg after the Jets' 4-3 overtime win Monday in Chicago. St. Louis pulled even with Nashville thanks to a 3-2 shootout win over Colorado Monday on a game-deciding goal by former Sabres center Ryan O'Reilly. With Nashville idle, the Preds, Jets and Blues all enter Tuesday having played 79 games. Nashville forward Viktor Arvidsson enters Tuesday's game with 33 goals and his next one will set the franchise single-season record. The Predators, who were born in 1998, have never had a 40-goal scorer. Arvidsson is tied for the franchise mark with Filip Forsberg (2015-16) and Jason Arnott (2008-09). The Sabres provided big help to two-thirds of the NHL's Stars of the Week announced Monday. The No. 1 Star was Columbus goalie Sergei Bobrovsky, who blanked Buffalo here Sunday night, and No. 2 was Detroit forward Tyler Bertuzzi, who scored the overtime winner in the Red Wings' 5-4 victory here on Thursday. The No. 3 star was Arizona goalie Darcy Kuemper.